The Bullhead City Fire Department recognizes the fact that serious fires occur in homes every 60 seconds across the United States. More importantly, there is a fire related fatality every 2.5 hrs. Another 20,000 injuries occur in home fires annually. Protecting the families in Bullhead City is a top priority, which is why we have established the Fire Safe Neighborhood program. The program provides smoke alarms to those citizens who do not have the ability to provide them in their own home (see next paragraph for details). It also provides free fire extinguisher training to businesses and schools in the community. This training can be provided to a small or large group. If a homeowner would like assistance on how to use, or where to place their own home fire extinguisher then that information can also be provided. The Bullhead City Fire Department's Fire Safe Neighborhood Program offers free smoke alarms or battery replacement to low income Bullhead City residents. Senior citizens or permanently disabled individuals may also qualify. Install:The Bullhead City Fire Department recommends that you install at least one smoke alarm on every level of your home. Smoke alarms are designed to wake you up if a fire starts while you are sleeping. Be sure your smoke alarms are near bedrooms and other sleeping areas in your home. Free smoke alarms are available for qualified home owners. 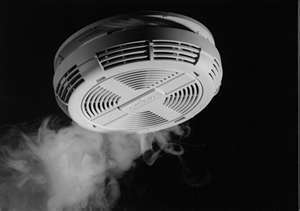 Test:When was the last time you heard your smoke alarm? Battery-operated alarms should be tested once a month to make certain they are working. Change:Replace the batteries in your smoke alarm at least once a year. The Bullhead City Fire Department is committed to protecting the lives of our citizens through proactive public education and assistance in your home or business. For more information or to schedule fire extinguisher training, please contact us at 928-754-2001.